1. Our Displays are the Best. To really ‘get the feel’ of how the fixtures will look and operate in your home, they need to be experienced in a setting that is as real as possible. 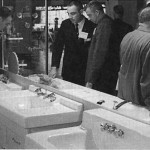 Our bathroom vanities and tops are all displayed at floor level, not up on some rack shelving. Our kitchen sinks are displayed in countertops at kitchen height so that you can actually experience how it will function in your home. Try out our toilets (with your clothes on!) by actually sitting on them at floor level. 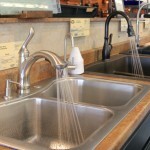 We even have several faucets, tubs and showers that are connected to running water for your “test drive”. New customers are amazed with our showroom! We try to greet every customer that comes in the door and ask them how we can help. No high pressure sales gimmicks. We respect your personal space and realize that sometimes you just want to think and look and to be left alone. We hire friendly, bright associates that like to help people and they become experts with the products that we sell. If we don’t know the answer we will do our best to find it out. 3. 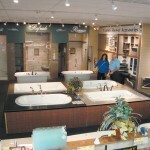 We Specialize in Bathroom Construction and Remodeling. From $2 repair parts to $50,000 luxury bathroom retreats, we help our customers achieve their dreams. 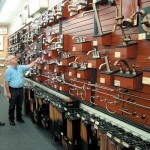 Hundreds of faucets, scores of toilets, sinks and showers in stock and on display. 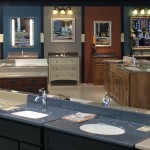 Come in and visit our showroom, you will enjoy getting new design ideas from dozens of display vignettes. You will love our working water displays! 4. We Provide You the Most VALUE for Your Money. We buy most of our products directly from the manufacturer, which helps us keep our prices low. In fact, we guarantee to match our local competitor’s prices on identical products. We keep our company on the cutting edge of new products, technologies and current trends. We don’t sell junk. If we try a new product and it fails to satisfy our customers, we get rid of it quickly. 5. Quality Name Brands and Manufacturers. We are the home of the “good stuff”, names like Kohler, TOTO, Delta, Moen, Blanco Sinks, RonBow, MAAX, Sterling Plumbing, Swanstone, Bertch Cabinets, Panasonic and Aquabrass. We constantly add new fixtures and devices that we know our customers will want to see and experience. With literally hundreds of years of accumulated experience we get pretty good at finding the right products for your home. 6. We Provide Installation Solutions. 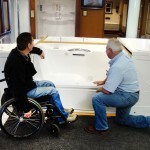 Our associates will help you find the best way to complete your installation. Many of our customers will install the items themselves with a few tips from our in-store experts. For others, the best answer is to hire a licensed professional installer from our approved list of contractors and plumbers. Our goal is for you to have a quality project that you are proud of and that will last and last. 7. We Put the Customer First. When you visit Handy Man you can usually park in the front row of the parking lot. 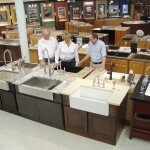 With everyone’s busy schedules it can be hard to find time to get together and even look at new fixtures for your home. 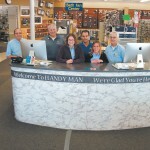 Handy Man is open seven days a week and we stay open until 9:00 pm during the weekdays for your convenience. 8. We Have Been Doing this for a Long Time. Our company was founded by our grandfather in 1946 and we have enjoyed helping customers ever since. The technology and the products have changed over the years, but in the end, it is still people helping people. Please give us an opportunity to serve you. We will surpass your expectations. 9. We Stand Behind Our Products. Things don’t always go as planned in a remodeling project. If you are disappointed in how one of our products works out for you, please let us know, and we will go to work on finding a solution that satisfies you. Our goal is to have satisfied customers for life!